2018 Atari Awards Winners (and Feedback)! by Mike Haas aka iesposta and Darrell Spice Jr.
CONGRATULATIONS TO ALL THE WINNERS AND NOMINEES! 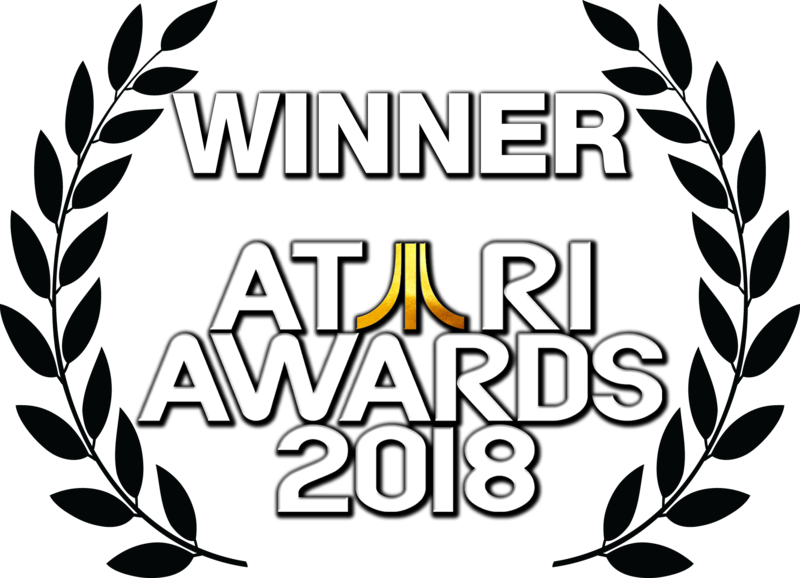 Here are the results of yesterday's 2018 Atari Awards! There were so many amazing games released in 2018 and we were so happy to honour all the hard work that the developers put into the games, demos and hacks. Thank you to Brian Matherne and Albert Yarusso for co-sponsoring the event and to everyone who watched the show live yesterday on our Twitch channel! Also I want to thank my co-presenters Darcy, Aerlan and Tanya and also Corey who ran the audio/video mixer during the show! We would love to hear YOUR thoughts on the Awards show!! - What did you think of the results? - What did you think of the voting process? - What did you think of the nomination results? - What did you think of the awards presentation? Edited by cimmerian, Mon Feb 25, 2019 12:17 AM. as previously mentioned in previous post, I will be using the winners in the harmony games next month no order as of yet,but one will be used at Video game Summit in July. I think the awards were very well done, and a lot of fun! I appreciate all of the work that went into making this possible this year. I was happy with how the voting was done. I was afraid that if it were a public voting link that it would end up being a popularity contest where people ask their friends to go and vote for their game. Having it be limited to forum members meant that the votes came from people that were familiar with the games and the platform. I fully expected that Mappy would do as well as it did - it is simply a great, well-executed game! I'm glad also that 2nd and 3rd place results were announced for each category. As for categories, I think there are a good number now, and adding more would probably make it harder to manage. However, I think shifting a couple around might be good. I am honored and grateful to have won in the batari Basic category, but I don't know if I think this needs to be its own separate category in the future. I don't think that those who enjoy the games need to worry what tools were used to create them. If bB were eliminated as a category, I would suggest either replacing it with a category for ARM-assisted games to allow for apples to apples comparisons, or perhaps the reverse and have a 4K game category (which is its own technical challenge, and usually also means no hardware assistance or extra RAM). Overall I think you guys did a great job. I felt that things ran quite well for a first go for a more production (right word to use?) heavy show. The issues that cropped up were not that bad and fell in with the usual things that happen.... they made the show fun. I think they're were a good number of categories and nominations this year and the length of the awards show was perfect. As for suggestions, I will go against the grain of all those who suggest technically separations and instead suggest separate genre categories. Like Shooter, Action/Arcade, RPG, and puzzle. Granted, that is, if there are enough entries for it. This would probably help expand the number of "winners" better than anything else. If you do want to appease the crowd, I would suggest splitting out the technical achievement category into the suggestions giving by everyone else: Best 4k technical achievement, Best ARM technical achievement, Best Bb technical achievement... that would probably work well when mixed in with the Genre categories... and then having a "presentation group" of categories similar to this year: Graphics, Sound, Music, and Packaging.... So three groups (Genres, Technical Achievement, and Presentation) each with 4 categories a piece. 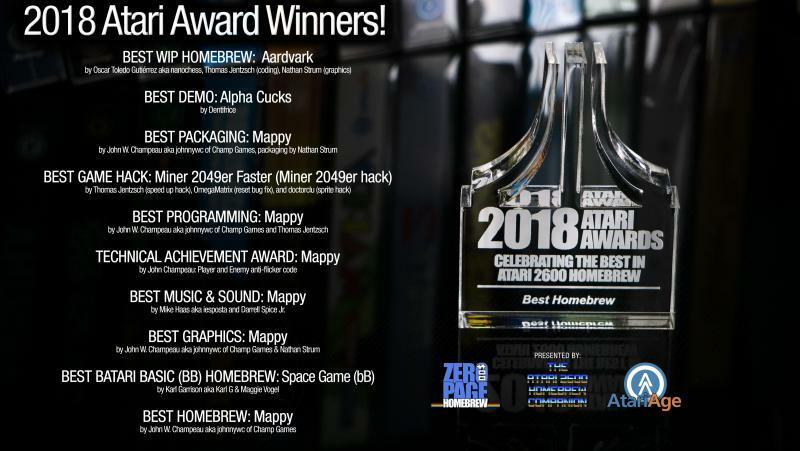 I thought the overall process was great, James looked very dapper on the night and the efforts of all the parties, ZPH crew, Al @ AtariAge & Arenafoot, was very much appreciated. It was a lot of fun! I liked everything. To me splitting the homebrews into more categories is will miss a lot of elements. For example if a game is 8K assembly then it does not fit the 4K category, best BB category, or ARM category. Every person will have a different opinion so you won't get very far. My suggestion is to combine the best of BB into the Best Homebrew category and increase the entries to 20. To even the playfield with the judging I would note if the game is ARM, BB, extra ram, and so in brackets beside the title to give an idea of the construction. Since this would now be a large category, maybe award 1, 2, 3 place trophies. To me splitting the homebrews into more categories is will miss a lot of elements. For example if a game is 8K assembly then it does not fit the 4K category, best BB category, or ARM category. Every person will have a different opinion so you won't get very far. I feel like I was a bit misunderstood here. Just to clarify, when I mentioned splitting into 4k/BB/ARM groups, I was referring to this years "Technical Achievement award" and not the general categories overall... Which is why my first point was to suggest splitting by genres, as I feel that would be a better thing to focus than the whole Bb vs Assembly. Please let me know if you would like me to elaborate a bit more. I wasn't responding to your post, and actually I didn't read your post. This was just a general idea of mine of not splitting the homebrew categories into more pieces, and combining a couple of the previous categories. Back to 2018 Atari Awards! Jaguar HSC_SEASON 13_Wrap-up, Winners, and Prizes! Carol vs. The World: The Official 2014 Winners!